Within the graduate program, students develop the knowledge and skills necessary to work as professionals in clinical, school, health, and other community settings as scientist practitioners. Students and graduates are expected to bring scholarship and reflection to their work, as well as an understanding of diversity in clientele, methodology, and application. Graduates report that their training occurred in a positive learning environment that recognized and nurtured diversity while emphasizing academic excellence. Program faculty produce scholarship that enhances teaching, involves students, and contributes to the profession of psychology. Furthermore, faculty members consult with and render academic and practical assistance to local human service agencies, hospitals, and regional schools. Accreditation of a graduate program in applied psychology insures that the program provides training in both the science and practice of psychology that meets the highest national standards. The University’s Master of Science program in Applied Psychology is accredited by the Master’s in Psychology and Counseling Accreditation Council (MPCAC). MPCAC is affiliated with both the Council of Applied Masters Programs in Psychology (CAMPP) and the North American Association of Masters in Psychology (NAMP). The School Psychology Option is approved by the South Carolina State Department of Education to train School Psychologists (Level II certificate), is approved by the National Association of School Psychologists (NASP), and is nationally recognized by the National Council on Accreditation of Teacher Education (NCATE) at the specialist level. The M.S. in Applied Psychology, Clinical/Counseling is accredited by the Masters in Psychology and Counseling Accreditation Council (MPCAC) for the period of April, 2018 through April, 2020. 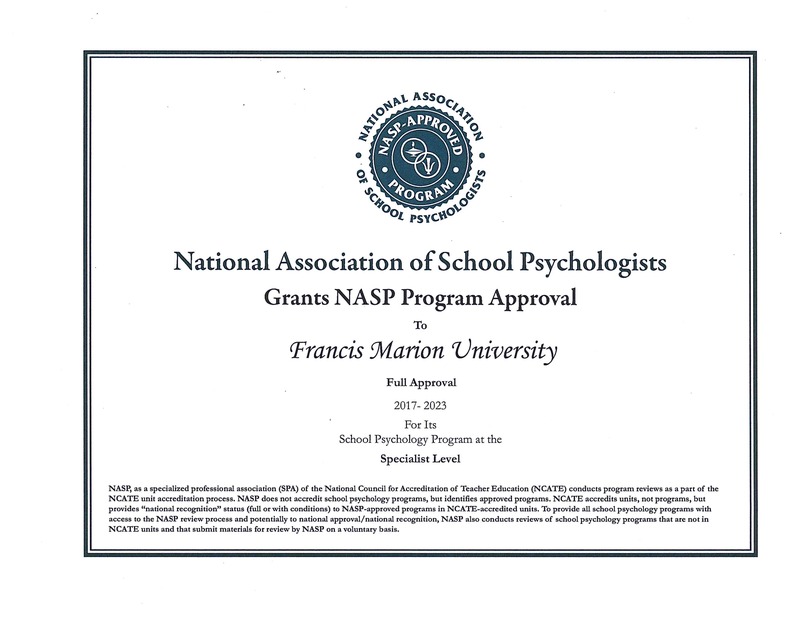 The FMU Department of Psychology’s Specialist in School Psychology is approved by NASP. 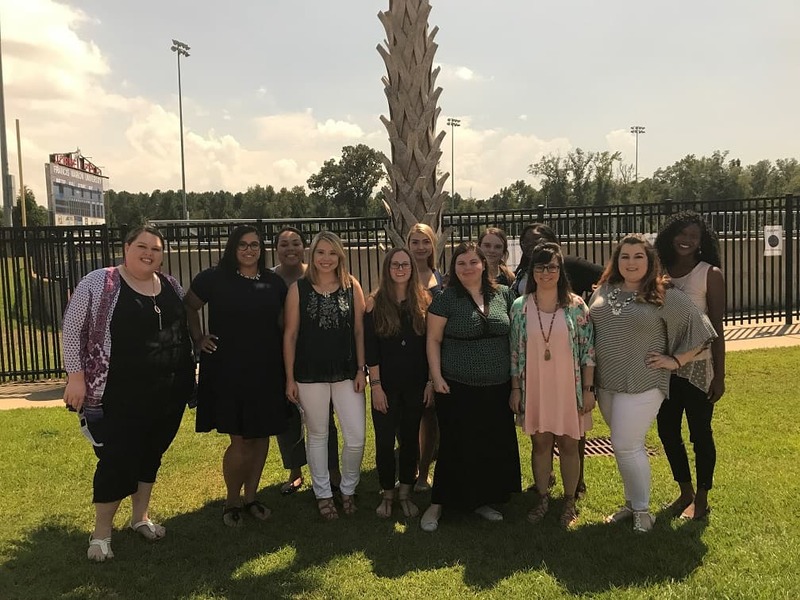 The FMU Department of Psychology’s Master of Applied Psychology – Applied Behavior Analysis is approved by the BACB (Behavior Analyst Certification Board). Clinical/Counseling Psychology is an option in the Master of Science in Applied Psychology program. The option is designed to provide training in clinical/counseling psychology leading to employment in human service agencies, hospitals, or similar settings. Consistent with this purpose, the program involves training in assessment and diagnosis, therapy, community intervention, and research. Students may also use the program as preparation for doctoral-level study; those students must conduct extracurricular research in a faculty member’s lab in order to be a competitive doctoral candidate. Students must apply to be admitted to the program. Most courses and practicum experiences will occur during the day, although a select few courses will be offered in the evenings. Courses offer a blend of classroom activities and experiential training designed to acquaint students with both theory and practical applications of psychological knowledge. The typical course of study is a minimum of 60 credit hours, spanning 2-1/2 years. Students may take additional courses as needed for additional training or for licensure in other states. Graduates are eligible to apply for LPC (Licensed Professional Counselor) licensure in South Carolina, with the ability to “assess and treat serious problems,” as defined in standard diagnostic nomenclature. For more information about LPC licensure, students should access the website of the Board of Examiners for Licensed Professional Counselors. • Experiential training in the program begins with two practicum experiences: Students are placed at a community training site for their first year, then they are placed at a different site for their second year. Students accrue a total of at least 200 hours at their placement sites. In addition, their assessment courses include a total of at least 150 hours of practicum experience. • The capstone experiential training experience is an internship that occurs after all coursework is completed; during internship, students accrue a minimum of 600 hours of supervised clinical training. – Download the program models and course descriptions for fall and spring entering classes here. – For more detailed information about required coursework, course offerings, program sequencing, practica, and internship, applicants are encouraged to view the appropriate section of the FMU Catalog. All documents and forms for Clinical/Counseling Psychology have been relocated to blackboard.fmarion.edu. They are located in the Perpetual Course entitled “Clinical/Counseling Psychology Graduate Program”. If you are currently enrolled in the Clinical/Counseling Psychology Graduate Program and do not have access to this course, please contact Brian Smith at 843-661-1640 or Charlotte Stephens at 843-661-1641. 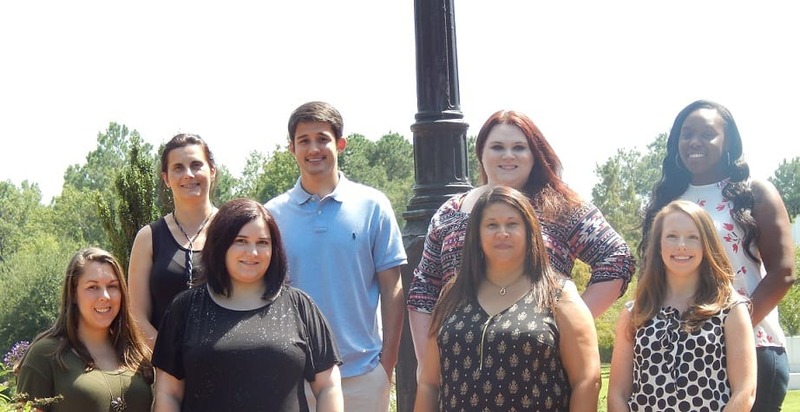 Francis Marion University is proud to offer a Master of Science in Applied Psychology with an emphasis in Applied Behavior Analysis (MSAP/ABA). Additionally, we offer a 6-course sequence in Applied Behavior Analysis for individuals who have earned a Master’s degree. The MSAP/ABA and the ABA 6-course sequence include a Behavior Analysis Certification Board®(BACB) verified course sequence. Individuals who complete the ABA classes will fulfill the coursework requirements to take the examination for certification as a Board Certified Behavior Analyst® (BCBA). Applied Behavior Analysis (ABA) is an option in the Master of Science in Applied Psychology program. The option is designed to provide training in Applied Behavior Analysis leading to employment in human service agencies, school districts, and private industry. Applied Behavior Analysis (ABA) is a field of study that uses a systematic approach to influence socially significant behaviors through the identification of reliably related environmental variables. Behavior change techniques are employed using these findings to effect meaningful changes in clients’ lives (bacb.com). Behavior analysts and behavior therapists provide services consistent with the dimensions of ABA. Common services may include, but are not limited to, conducting behavioral assessments, analyzing data, writing and revising behavior-analytic treatment plans, training others to implement components of treatment plans, and overseeing the implementation of treatment plans. Behavior analysts are qualified to provide services to clients with a variety of needs, including improvements in organizational functioning (e.g., staff performance, management and pay structure interventions), skill deficits (e.g., communication, adaptive behavior), and problem behavior (e.g., aggression, self-injurious behavior), among others (bacb.com). Behavior professionals work in homes and hospitals, clinics, classrooms, corporations and any other setting where reducing problem behavior and improving human performance is important. 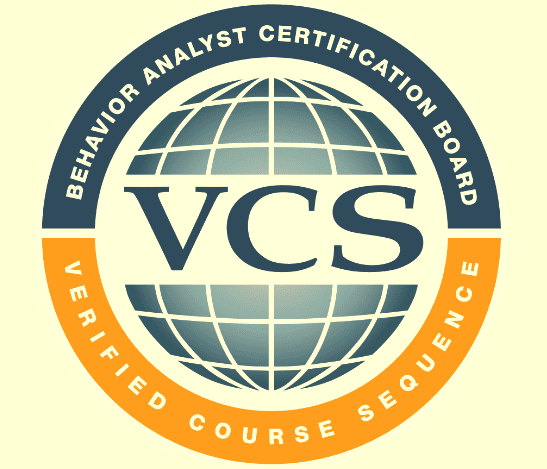 They typically work as part of a team of professionals and provide expertise in the analysis of behavior problems; this analysis helps determine why behaviors occur so effective treatments can be developed and implemented (www.bacb.com). Behavior analysts often work as consultants to agencies such as child welfare organizations and residential treatment programs where their goal is to optimize the potential of the children or adults who receive their services. This may involve carefully analyzing the living environment to determine skills that the person can acquire to increase their independence and improve their access to the community. Then, the behavior analyst will develop a task analysis and effective training program to assist the person in acquiring the skill (www.fabaworld.org). Students must apply to be admitted to the program. Most courses and practicum experiences will occur during the day, although a select few courses will be offered in the evenings. Courses offer a blend of classroom activities and experiential training designed to acquaint students with both theory and practical applications of psychological knowledge. Graduates will have completed the coursework necessary to pursue certification as a Board Certified Behavior Analyst® (BCBA). It is important to note that there are experiential requirements, and an exam that are not included as part of this Master’s degree program. Every effort will be made to help students arrange the necessary experience during their training. The mission of the FMU ABA training program is to provide the knowledge and skills necessary to produce highly skilled behavior professionals able to serve clients residing in the Pee Dee region and state of SC. These professionals will employ data-based problem solving and empirically-based treatment to effect meaningful change in the lives of the individuals they serve. – Download the program models and course descriptions for fall entering classes here. All documents and forms for the MSAP ABA option have been posted to blackboard.fmarion.edu. They are located in the Perpetual Course entitled “Applied Behavior Analysis Graduate Program”. If you are currently enrolled in the Applied Behavior Analysis Graduate Program and do not have access to this course, please contact Brian Smith at 843-661-1640 or Charlotte Stephens at 843-661-1641. School Psychologist has been ranked by U.S. News & World Report as the #1 Social Services job and #31 of the best 100 jobs overall. FMU is pleased to announce that after our initial review we continue to be a fully “Recognized” program through the National Association of School Psychologists through 2023. Candidates who graduate from our program while it holds NASP-approved status are automatically eligible for the National Certificate in School Psychology (NCSP), pending the attainment of a passing score on the Praxis II Examination in School Psychology, and documentation of an internship consistent with NASP standards. School Psychology is an option in the M.S. in Applied Psychology program. The option is designed to provide training in school psychology in preparation for subsequent admission to the Specialist in School Psychology (S.S.P.). Consistent with this purpose, the program involves training in diagnostics, assessment, intervention, consultation, and research. Students who complete the school psychology option of the MSAP but who do not continue to completion of the SSP degree are not eligible for state or national certification as a school psychologist. The school psychology option of the MSAP is not a terminal degree, but is preparatory for further specialist level training in school psychology. Students must complete the S.S.P. degree in addition to M.S. to be eligible for certification. Enrollment in the program is limited. Students must apply to be admitted to the program. Courses offer a blend of classroom activities and experiential training designed to acquaint students with both theory and practical applications of psychological knowledge. The School Psychology option is accredited by the Master’s in Psychology and Counseling Accreditation Council (MPCAC). Additionally, it is nationally approved by the National Association of School Psychologists (NASP) and nationally recognized by the National Council for Accreditation of Teacher Education (NCATE). All documents and forms for School Psychology have been relocated to blackboard.fmarion.edu. They are located in the Perpetual Course entitled “School Psychology Graduate Program”. If you are currently enrolled in the School Psychology Graduate Program and do not have access to this course, please contact Brian Smith at 843-661-1640 or Charlotte Stephens at 843-661-1641. For more detailed information about required coursework, course offerings, program sequencing, practica, and internship, applicants are encouraged to view the appropriate section of the FMU Catalog. 1. Complete the MSAP (School Psychology Option) from FMU, or possess a documented master’s degree in school psychology or closely related field from another university, and be accepted as a S.S.P. degree seeking student in school psychology. 2. Complete the appropriate group of courses, practica, and internship. NOTE: Students with master’s degrees from other programs who are accepted into the S.S.P. program may have additional coursework or practica to be completed. Please see the current MSAP/S.S.P. program of study here. Please see the current MSAP/S.S.P. program of study for Project CREATE students here. Congratulations to our Fall 2014 Cohort on their recent graduation! Enrollment in the program is limited, and the admissions process is competitive. Students must apply and be accepted as either a graduate degree student or graduate non-degree student in order to register for courses. Students develop an organized plan of study in consultation with an adviser. Courses are offered during late afternoon and evening hours. Practicum and other clinical experiences generally occur during normal business/school hours, but may require evening or weekend commitments. Courses offer a blend of classroom activities and experiential training designed to acquaint the student with both the theory and the practical applications of psychological knowledge. While classes are taught in the late afternoon and evening, school psychology students should be mindful that practicum experiences must occur during the day. Additionally, the internship must be a full-time experience as a school psychologist in a public school setting during the fall and spring semesters. Clinical/Counseling students also should be aware that their internship requires a full-time commitment that may require them to take a leave of absence from other employment. Students who are accepted into the graduate program must contact the Coordinator of the Clinical/Counseling Option, or the School Option (as appropriate) for advising. Students may apply to the graduate program at FMU as either graduate degree students or as graduate non-degree students. They must be accepted and enrolled in the program prior to registering for classes. Graduate degree students are accepted into either the Clinical/Counseling Psychology Option or the School Psychology Option. Graduate non-degree students are typically professionals who are already practicing in the field and need additional coursework for professional development, certification, or licensure. • Students who successfully complete the Clinical/Counseling Psychology Option will earn the Master of Science (M.S.) degree in Applied Psychology, Clinical Counseling Psychology Option. • Students who successfully complete the School Psychology Option will earn the Specialist in School Psychology (S.S.P.) degree. First, school psychology students must complete the M.S. course of study. After successful completion of the M.S. program, they will be admitted to the S.S.P. program only upon approval by school psychology faculty. Approval is based upon performance in the M.S. program. Applicants who previously have obtained a master’s degree in school psychology or a closely related field from another university and wish to improve their training to the specialist level may apply to the SSP degree program. Note: Applicants to the S.S.P. program who have earned a master’s degree from another institution’s program must submit all materials required of students applying for graduate degree status, outlined below. Additionally, applicants with a master’s degree from another institution who are accepted into the S.S.P. program may have additional coursework or practica to be completed. Students who have already completed the school psychology option at FMU and who have received SC certification at the level of School Psychologist II or who have obtained NASP NCSP status may not apply for the S.S.P. program. 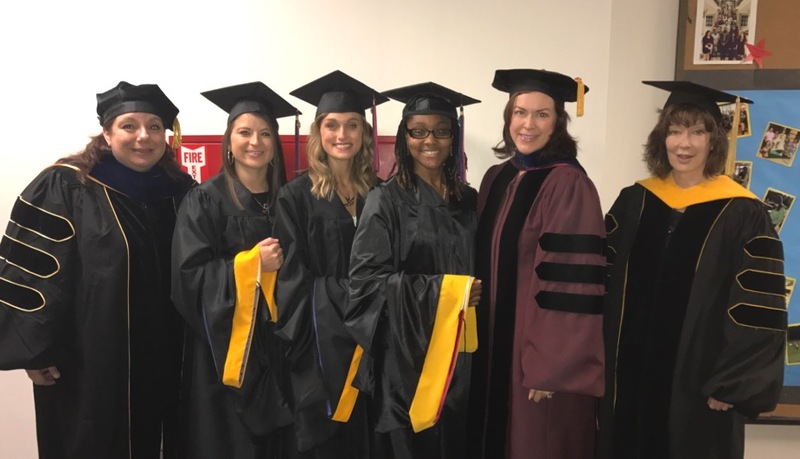 • Graduate non-degree students in psychology do not seek a graduate degree at Francis Marion University but typically already possess a graduate degree and wish to take a specific course or courses only for professional growth, certification upgrade, or recertification/license renewal. 1. Submit a graduate application for admission and pay the non-refundable graduate application fee. 2. Submit official transcript(s) of ALL undergraduate and graduate work. Applicants must have earned an undergraduate degree from a regionally accredited institution as evidenced by the official transcript(s). It is recommended that applicants have a 3.0 or higher grade point average in all undergraduate and graduate coursework completed at the time of application. Transcripts also are examined for relevance of undergraduate preparation for graduate education in psychology. All applicants must have completed an introductory or general psychology course, as well as a course in behavioral statistics. Note: All S.S.P. applicants with a master’s degree from another institution must document relevant master’s level training in school psychology. 3. Submit scores on the Graduate Record Examination taken within the last five years. Only the general test is required; the Psychology subject test is not required. We recommend GRE combined scores above 290 with a minimum of 140 on each of the Verbal Reasoning and Quantitative Reasoning sections. All applicants must use the following code when prompted to designate the university as a test score recipient. From the following list, choose the appropriate code that corresponds with your particular program. 4. Submit two letters of recommendation from former professors or professional associates/supervisors who can attest to the academic potential of the applicant. We strongly prefer letters from faculty members in academic settings. Please use the link provided below. 5. Submit a personal statement, 500 to 750 words in length, indicating one’s interests in clinical/counseling or school psychology, career goals, and reasons for seeking admission to the Master of Science in Applied Psychology and/or Specialist in School Psychology programs. 6. Submit a Résumé or a Curriculum vitae. 7. If applying to the Clinical/Counseling Psychology program, interviews will be offered to select students. Interview days will be arranged and scheduled by the program coordinator. Please complete the form listed below to provide your contact information for an interview. 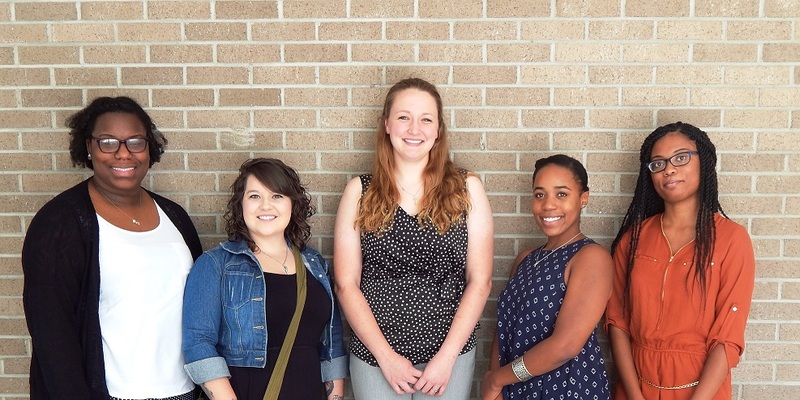 In addition, all applicants should complete the departmental Assistantship – Scholarship Application and submit it by the application deadline to the Psychology Department, Francis Marion University, P.O. Box 100547, Florence, SC 29502-0547. Only complete applications are reviewed for merit by the Psychology Department faculty. Determination of merit is based upon consideration of all components of the application packet. In the admissions decision process, consideration is given to both the merit of each application received and to the number of slots available in the program at the time of application. 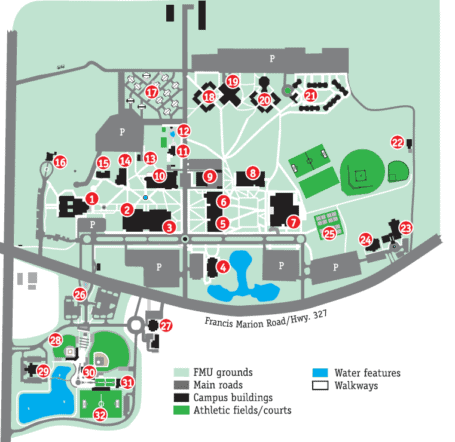 Favorably reviewed applications are submitted to the FMU Graduate Council for review and approval. Offers for admission are given to those applicants who show the most promise of success in graduate studies. *Note: Applicants for the School Psychology Option are only accepted for Fall Admission. Applications are due February 15th. All applicants will be notified of their acceptance status on March 15th. Applicant notification regarding acceptance of admissions offer is requested by April 15th. Students accepted into the School Psychology Option must begin their studies during the Summer II session, which begins in July. Applicants possessing a master’s degree in school psychology and accepted directly into the SSP degree program may be accepted for either Spring Admission or Fall Admission. Application materials received after the application deadlines may still be considered for admission if there are available positions within the program. It is the applicant’s responsibility to gather all materials to complete his/her application. Only completed applications (with all required materials) will be reviewed for possible admission. Students are responsible for monitoring their financial situation, including the amount of aid (e.g., federal loans) that is available to them, as well as the cost of tuition. All students are strongly encouraged to visit the Office of Financial Assistance to discuss their situation, receive guidance on applying for aid, and for assistance preparing for their educational future. There are a number of scholarships and assistantships available to students enrolled in a Psychology graduate program. Scholarships and assistantships are available on a competitive basis. Students must complete an application to indicate their interest in receiving one of these scholarships and/or assistantships. Read more about the available scholarships and assistantships and to complete the application here. Applicants should complete this online form by the application deadline(Fall-February 15th/Spring-October 15th). All applications returned by the specified deadlines will be reviewed for academic merit by the Psychology Department faculty. Determination of merit includes consideration of academic performance at the applicant’s baccalaureate institution and, for currently enrolled graduate students, performance in the a Psychology graduate program. For the PSY 216 teaching assistantships, potential for effective instruction is an additional consideration. The Department has a limited number of $250 scholarships available to graduate students enrolled in the MSAP and SSP programs. Out-of-state students who receive a scholarship in the amount of $250 or more per semester are eligible to receive an out-of-state tuition waiver (i.e., they will pay in-state tuition). 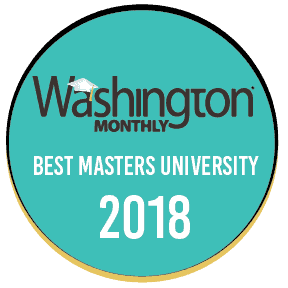 Awards made in the spring and used toward that spring semester’s tuition also can apply toward the subsequent summer semester’s tuition. Both in-state and out-of-state students are considered for these awards, and award decisions are based solely on academic merit. These scholarships are renewable for 6 consecutive semesters (i.e., 3 academic years) or for a period of time approved by the Department, contingent upon continuous enrollment in a Psychology graduate program and satisfactory progress in the course of study. A student may receive a scholarship through the first semester in which he/she is enrolled in internship (i.e., the scholarship no longer applies during the semester in which an “Incomplete” grade for internship has been carried over). A wide range of on-campus assistantships are available to students enrolled in a Psychology graduate program. All assistantships entail approximately 20 hours of work per week. Approximately 25-30% of MSAP students receive an assistantship. Please note that the assistantships offered may vary from semester to semester. The Psychology Department has developed relationships with other areas on campus so our students also are eligible for those assistantships. 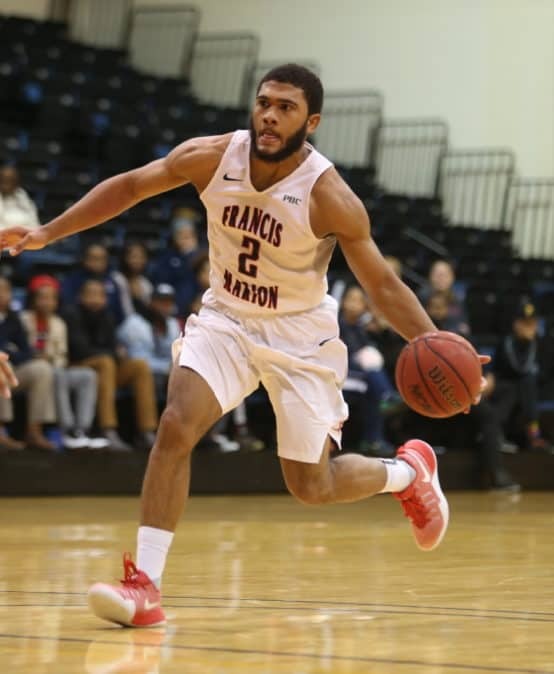 Students seeking more extensive employment that is flexible with their degree program might consider applying to the FMU Richardson Center for the Child. Information about other sites that tend to hire our students will be posted here as it becomes available. In addition, current students should investigate the National Health Service Corps’ loan repayment program. Information can be found here. Since 1998, The National Association of School Psychologists (NASP) has provided a national review and approval service for graduate programs in school psychology. 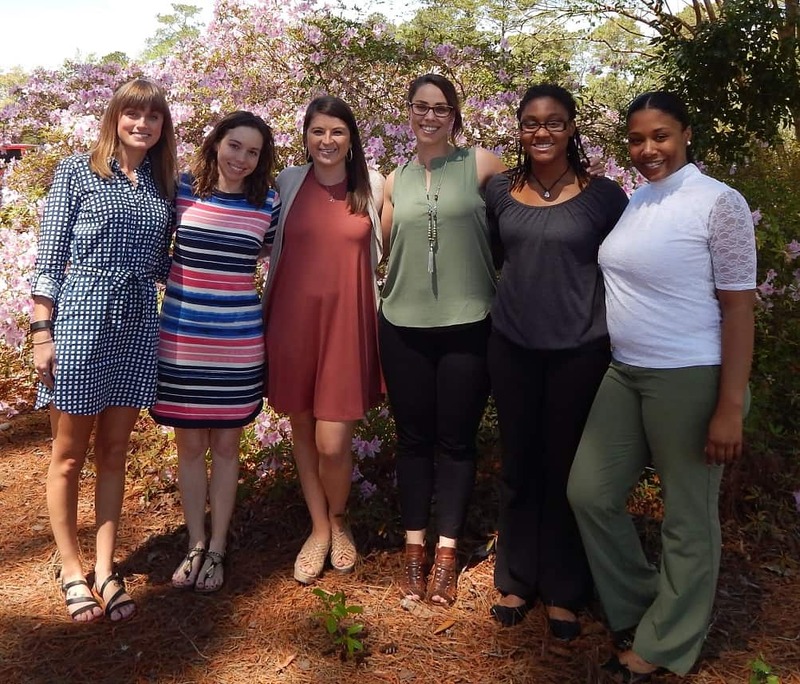 The Graduate Program in School Psychology at Francis Marion University continually has been recognized by this accrediting body since 2001. 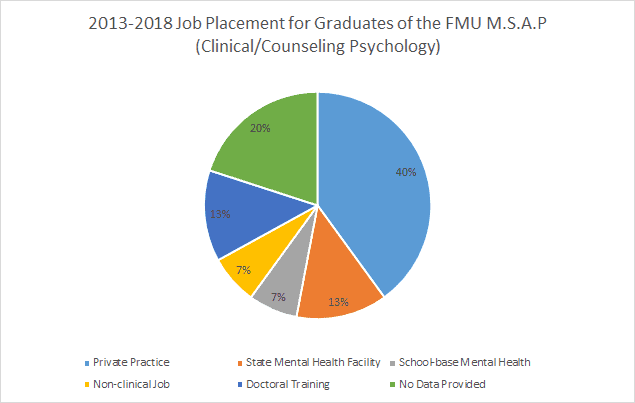 The FMU School Psychology Program is committed to providing program candidates with the opportunity to receive a premier education, research experience, and networking opportunities. With these experiences, students will be better equipped to accomplish their respective personal and professional goals surrounding the discipline. 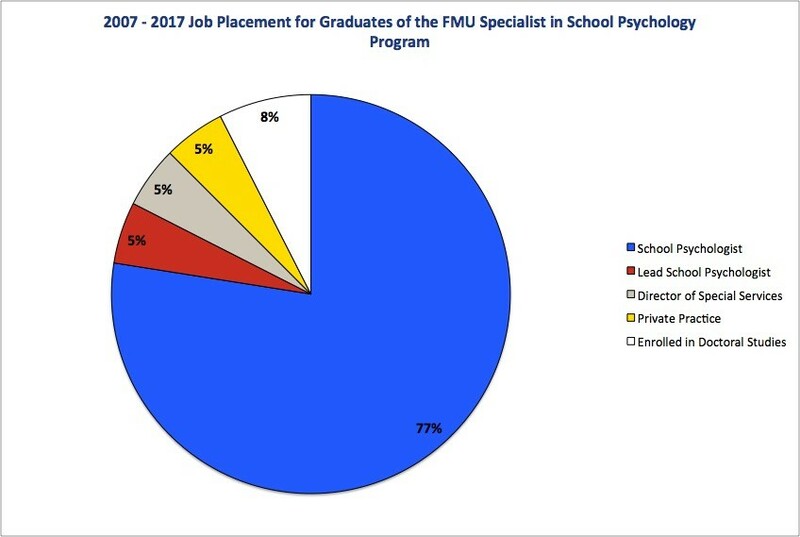 Following the standardized guidelines and practices endorsed by NASP as well as participating in national events, FMU maintains its relevancy in academia and strives to support the development of future psychologists. 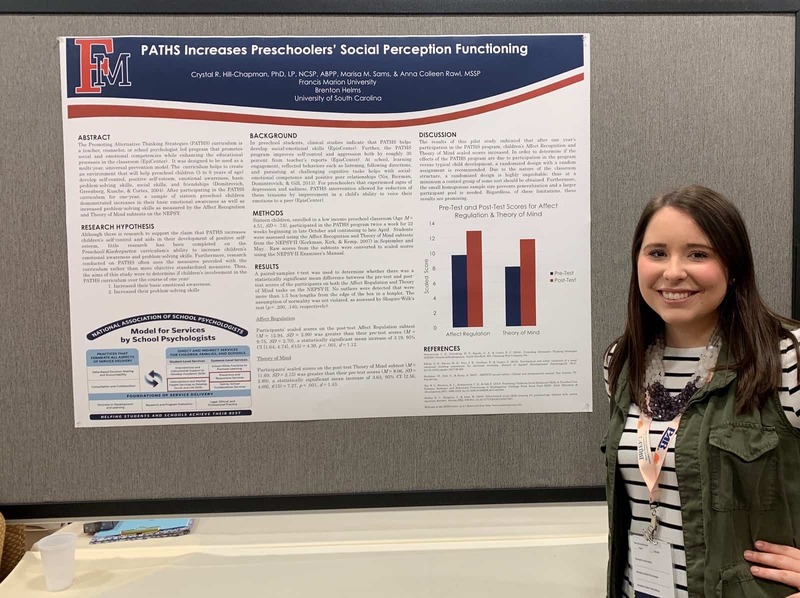 The FMU Psychology Department continues to develop its presence in this organization and in the field of psychology through faculty and student participation at national and multi-national conferences such as the NASP Annual Convention. At these conventions, faculty and students have presented research and hot topics surrounding the profession. Students present their final research projects at poster sessions, allowing them to display and discuss their peer-reviewed bodies of work as well as providing them with networking opportunities. At the 2017 NASP Convention held in San Antonio, TX, several of our school psychologist candidates presented their faculty supervised research projects. The School Psychology program at FMU boasts a 100% acceptance rate for scientific poster submission at this convention. Below are a few samples of the scientific posters that were accepted. In addition to a comprehensive education, our program offers students the opportunity to perform meaningful research with our distinguished faculty. 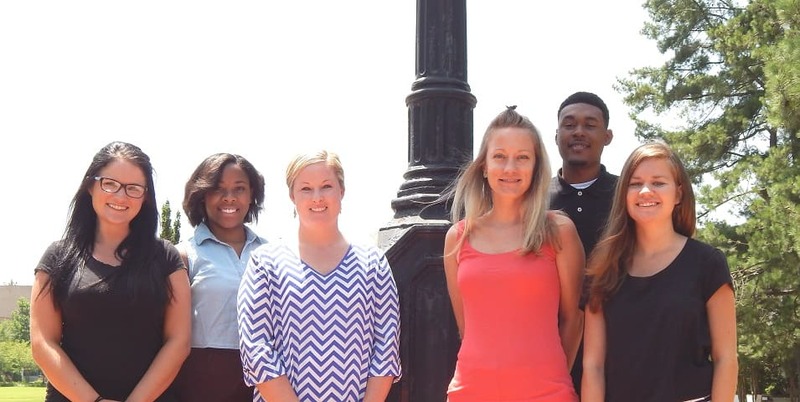 The FMU Psychology Department is proud to be represented by our highly motivated students and their scholarly work. Click on an image below to review our candidates’ research displayed at the 2019 annual convention.